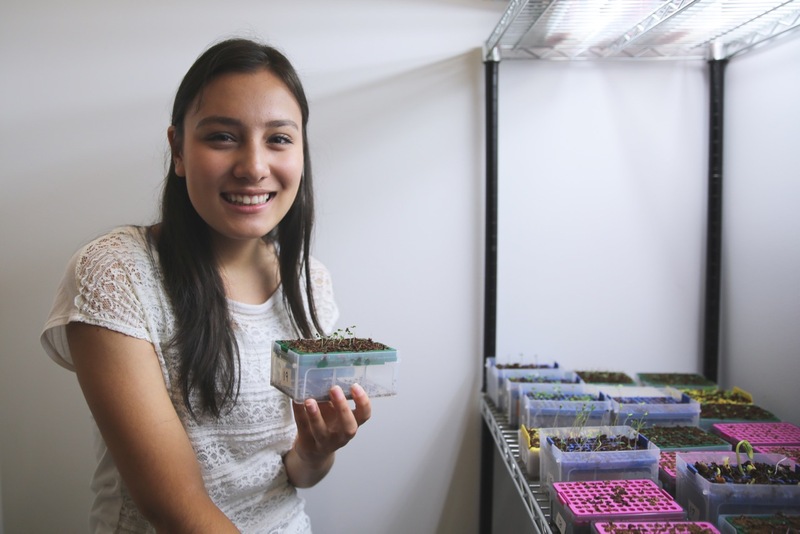 After setting up a hydroponics or aquaponics system, it’s really important to collect data. Not only is it essential to keep your fish and plants healthy and happy, but it’s also important in order to keep the system in balance. Too much or too little of a certain molecule can make the system go haywire and you risk inefficient plant and fish growth, disease, and/or plant and fish death. Collecting this information isn’t hard or time consuming, but it is very important! What tools are important for data collection? What types of measurements should be considered? Q: What should I measure in my aquaponic and/or hydroponic system? 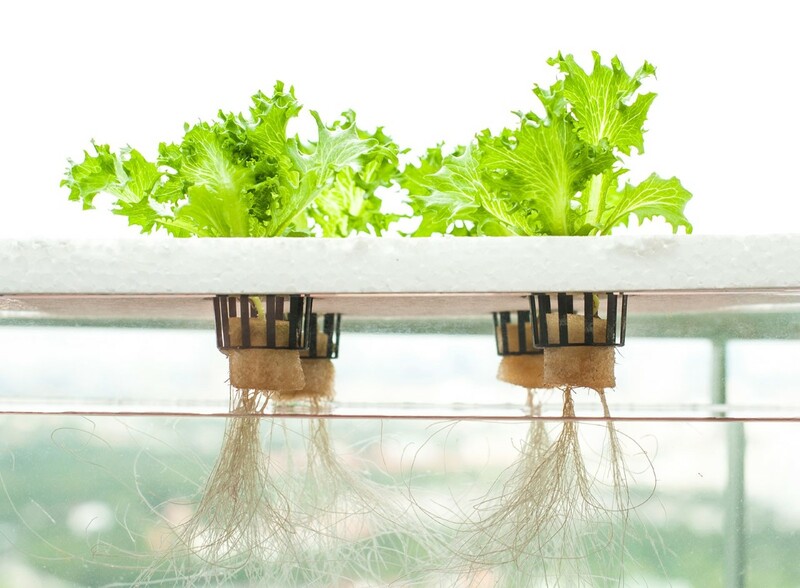 A: In an aquaponic or hydroponic system, there are some key components that need to be monitored to maintain proper water chemistry. Below is a list of all the chemicals and other data points that need to be measured. To learn more about any of these factors, click on the link. Q: What should I use to measure those components? A: In order to measure the amount of each element is located in the water, I recommend either using probes, test strips, or test kits. So what’s the difference between probes, strips, and kits? Probes are tube-like machines that can automatically read the amount of level of a certain element in the water. 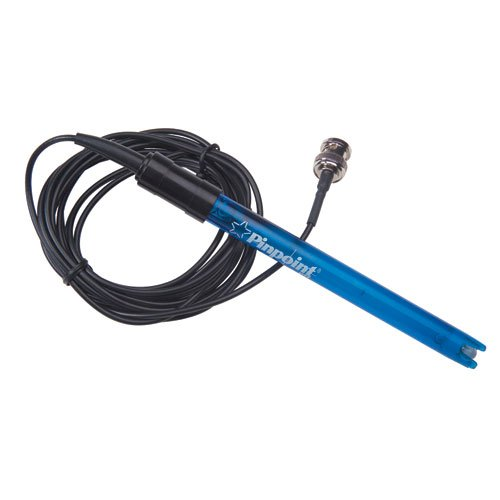 The most common type of probe is a pH probe, which automatically reads the pH of the water being tested. Pros of using probes– It is more accurate than test strips, and can be reused many times. Cons of using probes– Probes for each parameter that needs to be tested in hydroponics/aquaponics water has not been invented yet, and the ones that have been developed can be quite costly. pH probes cost anywhere from $20-$100, while probes for measuring ammonia can cost thousands of dollars. 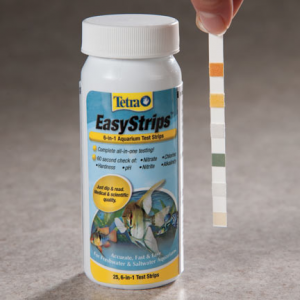 Test strips are plastic strips that measure for a certain element in the water. After dipping the strip into the water, the color of the individual squares on the strip can be matched up to the key in order to get an estimate of the amount that is in the water. Pros of using strips– Strips are a cheaper alternative to probes, and can provide a fairly accurate measurements of each element in the water. Cons of using strips– The measurements are not always 100% accurate, and it can be time consuming to have to dip the strip in water and wait for a minute before matching it up with key. 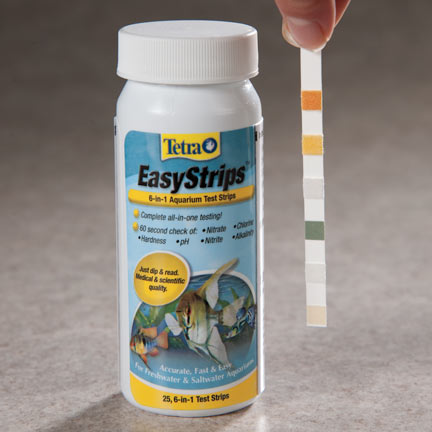 Here is a link to purchase the 6-in-1 (measures 6 elements in 1 strips including nitrate, nitrite, hardness, chlorine, alkalinity and pH) test strips online. 1. Grab one strip and soak it in the water for 10 seconds. 3. Match it up with the key on the side of the bottle. 1. Grab one strip and dip it in the water for 1 second. 2. Wait 30 seconds for the bottom 5 elements to settle, and wait an additional 30 seconds (60 seconds total) for the top element. *Use gloves when handling both types of test strips. Instructions for using the test strips are also located on the side of the bottle. Test kits are slightly more reliable than test strips, but take a bit more time to use. API offers a great Freshwater Test Kit where you simply add 5 mL of water to a tube, follow the instructions and add the provided solutions, and match the new color of the sample to a color chart. Pros of using test kits– Test strips are a cheaper alternative to probes, can be more reliable than test strips, and can provide a fairly accurate measurements of each element in the water. Cons of using test kits– The measurements are not always 100% accurate as with other forms of categorial/color-based testing. Q: Where do I record my system’s data? A: To record, monitor, and analyze your data, use Project Feed 1010’s data management site. Simply sign in using your Google account and create your first system! You can add measurements, explore other users’ systems, analyze your data, and socialize with the rest of the Project Feed 1010 network. It can be helpful to first collect your data on a sheet of paper and then transfer it to the website. 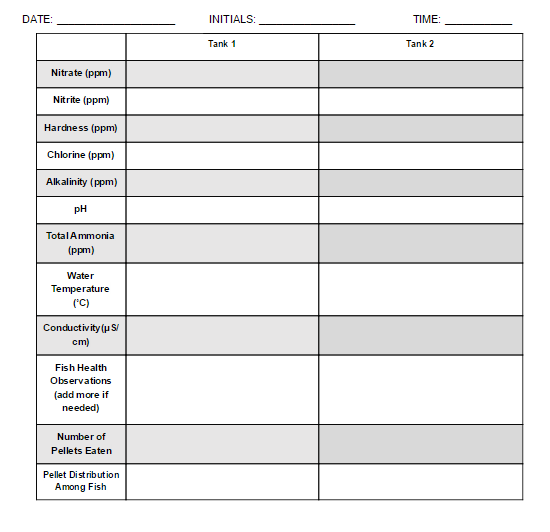 Here is an example of our data collection sheet. ISB has 2 aquaponic systems, so we labeled them “tank 1” and “tank 2”. Q: How often should the water chemistry be tested? A: Daily would be ideal, but every few days is also alright. The most important time to frequently monitor water chemistry is during the first few weeks of nitrogen cycling (see Laura’s post) to ensure your nitrifying bacteria are establishing themselves in your system and doing their job. Other than that, it is best to collect data consistently and accurately. 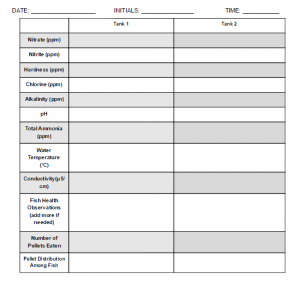 That’s the basics of data collection in a hydroponics or aquaponics system! If you have any more questions, feel free to check out the Institute of System Biology’s Project Feed 1010 website. Also, make sure to check out the other blog posts that the other interns have contributed. Happy data collecting!